There are a lot of cards to pick from that allow you to do whatever you’d like with your deck. From casual builds to more competitive ones, every card you pick is important and plays a critical role in the way your deck functions. But every now and again, there are cards that end up allowing you to utilize the effects of two cards all at once – you just pick the one that’s right for you. Trainer Cards with multiple effects have been present in Pokemon for a while, and they’re always some of the most interesting ones. 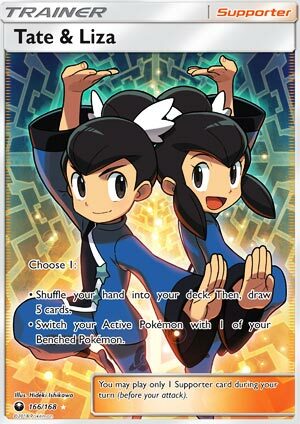 Tate & Liza is one such Trainer card, being a Supporter with a choice: you can either shuffle your hand into your deck and draw 5 cards, or you can Switch your Active Pokemon for a Benched Pokemon. It’s effectively a combination of Cynthia and Switch all in one card! What’s not to like? In fact, it’s that utility that makes it so effective! Keeping your opponent on their toes as you swap out a Pokemon to remove a Status Condition while promoting an attacker, or even refreshing your hand to get new cards into the mix! The fact that you can add another draw Supporter that nets you 5 cards is great! So what’s the big deal? Shouldn’t Tate & Liza be good enough to play already? Well, remember how I compared it to Cynthia and Switch before? That’s really the first question to ask yourself about. Tate & Liza do things like what Cynthia and Switch do, but fundamentally the results are much different than if you were to play those cards. Cynthia, for instance, nets you 6 cards when you shuffle your hand into your deck rather than 5, making Tate & Liza a slightly inferior version of that. Not a bad card by any stretch of the imagination, but not better than Cynthia. So what about Switch? Functionally, they’re both the same effect, but Switch is an Item card, meaning it won’t cost you your Supporter for the turn; Tate & Liza, on the other hand, is like a copy of Switch that says, “You can’t play Supporters during this turn.” The cost to play Tate & Liza as another Switch is much higher, and Switch doesn’t often see play in a lot of decks as is. Still, Tate & Liza has a great load of potential working alongside these cards rather than competing against them. You’re still more likely to run 4 Cynthia, but why not have a couple of Tate & Liza around for more draw power? And if Switch is too much for your deck to handle, would you be able to give up that draw for Tate & Liza to help you rotate your Pokemon? Guzma would certainly be better overall, but you won’t always have a Guzma in hand – and sometimes you may not want to switch your opponent’s Pokemon. A lot of thought going into a card of such simple effects, eh? Arora Notealus: Tate & Liza offers something a lot of cards in the game don’t always offer – a choice. Sure, there are choices like what cards to put into your deck and what attacks to use or what Energy to attach where, but Tate & Liza is all about expanding your options, and functionally there are very few cards that give away options. We’ve seen some before, and they’ve proven to be either extremely effective, like Puzzle of Time, or complete duds, like Missing Clover. At least Tate & Liza doesn’t have to be played in multiples to utilize its effects. It’s that choice in utility that had Tate & Liza so far up in my own Top 10 list! Next Time: Strutting down the street, cause a cat’s the only cat who knows where it’s at. Tate and Liza is another one of those cards which provides options, which could provide flexibility. You either shuffle your hand onto your deck and draw 5 cards, or you switch your Active Pokemon with one of your Benched Pokemon. Regardless of which format Tate and Liza would be used, they will have to be compared with other cards that does a similar thing. And yes, that means both effects. The first effect is identical to Shauna Supporter card, but it is outclassed by Cynthia. And the second effect are outclassed by item cards like Switch or Escape Rope. They might get away by avoiding item lock and not fueling up Trashalanche’s attack. Despite listing various cards that compete with Tate and Liza, they can serve as placeholders in case 4 Cynthia or 4 Switch is still not enough such that you need even more usage that’s essential to your strategy. The only formats where they could shine the most is Limited and Theme. Tate & Liza (CES 166) debuts in the Pokemon Trading Card Game from the Celestial Storm expansion set. This card definitely points in the right direction – a Supporter that gives you choices. As we all know, the more choices you have, the more chances you have. I really like the design of this card and its dual utility. Its usage, ultimately, will come down to the effectiveness of another card, however. We wrote the other day about Copycat and how it could potentially put a LOT of cards in your hand. I started testing Copycat Tuesday night and will keep a close eye on its average draw amount. It’s my feeling that Copycat will only average something a little more than five cards, meaning that Tate & Liza’s versatility will make it the preferable play, but we’ll see how that goes. If Copycat ends up drawing something like six or six and a half cards on average, that means it could potentially surpass Cynthia, and Tate & Liza would probably fall to a one of at best. I like that we have a nice variety of choices in draw supporters right now. Sycamore and N might have left us, but the plethora of choices available to us (Tate & Liza, Copycat, Lillie, Hala, Sophocles, & Mallow) certainly make the game more interesting … and the combination of all of them might even result in a better draw support pool for us than last year. This is not a Throwback Thursday; as we reviewed the latest printing of Copycat on Monday, a card that has only become Standard and Expanded legal due to being reprinted in SM – Celestial Storm, we’re counting that as our “Throwback”. I just couldn’t come up with a catchy name for it. Instead, we’re looking at what would have been our 14th place finisher, Tate & Liza (SM – Celestial Storm 148/168, 166/168). This only appeared on two individual lists – one being my own at 12th place – Tate & Liza still managed 38 voting points. They are a Trainer-Supporter that gives you a choice between two effects; you may either shuffle your hand into your deck and draw five cards OR you may switch your Active Pokémon with one from your Bench. Poor Shauna; the only reason I can’t honestly say that Tate & Liza have replaced Shauna is that I don’t recall any successful, competitive decks proving Shauna was worth using… and even if I had, Cynthia would have replaced Shauna as of SM – Ultra Prism. Shuffling your hand away to draw five cards was never enough, even before Cynthia. Switch is a great card, but not if it was a Supporter. Olympia – another Supporter about to leave the Standard Format – proved that a “Supporter Switch” could prove worthwhile, but Olympia also healed 30 damage from the Active it Benched and enjoyed her time as a competitive card during a time when Item-lock was strong and Guzma didn’t yet exist. Which is why it is good that Tate & Liza give you a choice between the two effects; you can get a mediocre draw effect or an overpriced switching card and I just made that sound far worse than it is. Not that you’ve got any real time to enjoy it, but Tate & Liza isn’t for the BKT-On Standard Format, but it might become a common sight in the SM-On Standard Format that begins September 1. We no longer have the trinity of Cynthia + N + Professor Sycamore for draw power. We still have Cynthia, but now we’ve got to pick between what’s left and suddenly, Tate & Liza is looking a lot better. We’re also losing Float Stone, so having another means of easily Benching your Active while ALSO having the capacity to do something else is pretty handy. If Tate & Liza let you apply one or both effects, then this would be a very good card and probably worth running in multiples for most Standard decks (and as a single in most Expanded decks). The reality is that it is still something I expect to show up in a lot of decks because we don’t have anything clearly better. Some decks will be able to add in Hala to supplement Cynthia. Others will take their chances with Copycat or Lillie. I’m thinking Tate & Liza is near the top of these alternatives, but not by a glaring margin. In the Expanded Format, Tate & Liza are niche but not useless. Their direct competition is Olympia, as we’re already narrowing things down to Supporters that Bench your current Active other than Guzma. So you decide whether healing 30 or having the option to not switch out your Active but instead shuffle-and-draw five is the better deal. Speaking of better deals, Tate & Liza are great in the Limited and Theme Formats. Both the “Leaf Charge” and “Hydro Fury” Theme Decks contain one, and just like in the Limited Format, you won’t have enough draw or switching cards to satisfy your needs.